Rakusan did not include the Fan Series in his main sequence numbering. Therefore, the original number used for each of the 36 Series prints has been modified to identify the Fan Series members of its theme. The five different fan silhouette shapes have been here assigned arbitrary numbers 1 through 5. To indicate a fan design these shape designations are added to the 36 Series number separated by a hyphen. In themes which contain duplicated fan shapes, one has been arbitrarily designated A and the other B. 106-2 indicates that this is a Fan Series design with fan shape 2 in the 106 Quince theme. Like all other designs in this series, 106-2 was only produced in a single print run, and few copies are currently documented. The Fan Series woodblock prints of the 106 Quince theme were distributed in early 1934 in installment two (of twelve). The delivery documents for installment two remain to be discovered, but its delivery month was either February, March, or April 1934; and the woodblock prints would have been printed during the same month as the publication. 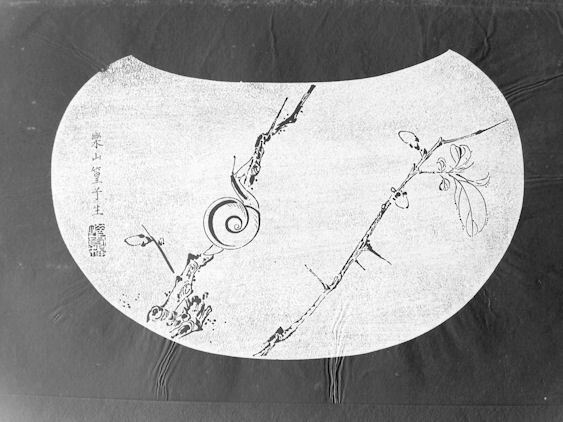 The composition of 106-2 shows tw0 branches of what appears to be a small quince bush trained as a bonsai. The technique is a combination of simple line drawings for the buds and thorny stems; with additional shading on the branches and main trunk. The ground surface is suggested by groups of dots. Other similar dots halo some of the branches and leaves. 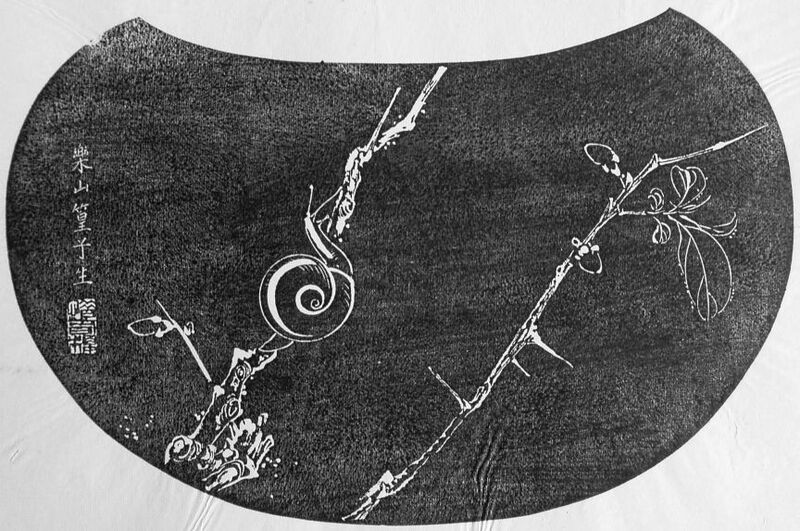 Climbing up on the left branch is a bush snail rendered as a line drawing. The three species of flowering quince are collectively known in Japanese as 木瓜, ぼけ, ボケ, boke, and in English informally as "Japanese Quince". Today the Japanese name is also used particularly for one of the most common garden varieties, Chaenomeles speciosa var. cf. lagenaria, a selection of an originally Chinese and Korean species early imported into Japan. There is also a shorter-growing native species, Chaenomeles japonica. These quinces have been bred into many forms for flower and fruit production and are often used in bonsai. Many varieties of quince have long, prominent thorns.